Throughout history, the mohawk has endured as a bold, statement-making haircut for men. It has been a symbol of the native North American Indian tribes, a battle look of Viking warriors, and a sign of allegiance to the 1970’s punk movement. But, recently, the classic style has received a modern update in the form of a fade. As striking as the original yet much more current, this updated version is ideal for modern-day rebels. Think you’re ready to give the daring style a try? Check out our roundup of the best mohawk fade haircuts for men. For a sharp, sleek, and ultra-modern look that is a universal head-turner, the taper fade mohawk is an excellent choice. If you’re a punk at heart but your day job won’t allow for a full-scale mohawk, this may be the look for you. By gradually tapering down to a clean shave, this mohawk appears more polished yet still edgy. 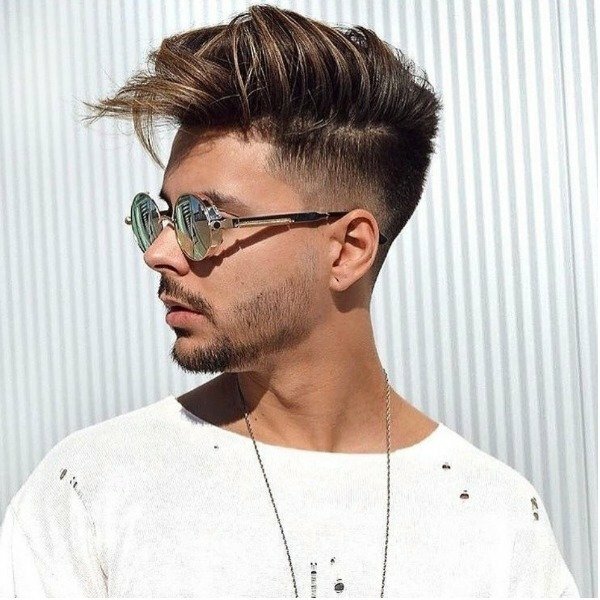 Whether you’re in the process of growing a full, rockstar mohawk or are looking for a modern take on the style, a short mohawk fade is a stylish way to take part in the trend. The best part about this is that as long as your hair isn’t cropped into a buzz or crew cut, it can be styled up into a mohawk. 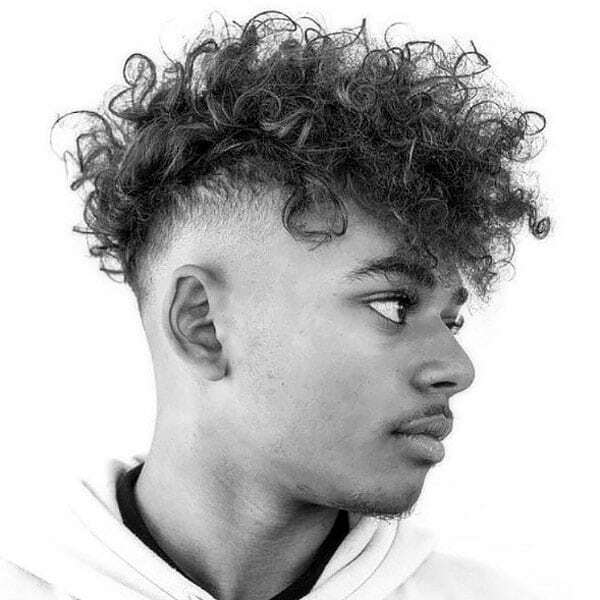 Due to the shorter nature of this look, the added feature of a fade helps to create fullness and depth to the hair for a masculine yet youthful appearance. Pair your bold, long mohawk with a mid or low fade this season for a crisp, on-trend look. By extending the hair down the sides of the scalp in a well-groomed fade, this look strikes a perfect balance between polished and punk. 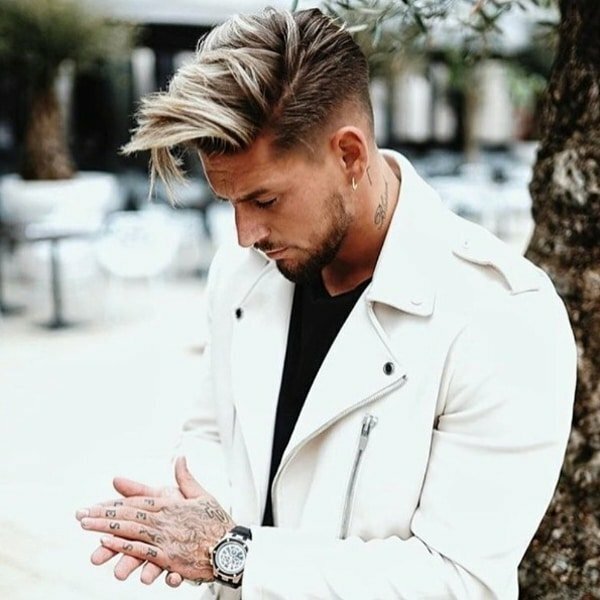 The carefree look is particularly ideal for gents in their early 20’s but is also a winner for older men seeking to highlight their inner youthfulness. If you’re looking for an effortlessly cool hairstyle, we recommend asking your barber for a low fade mohawk. 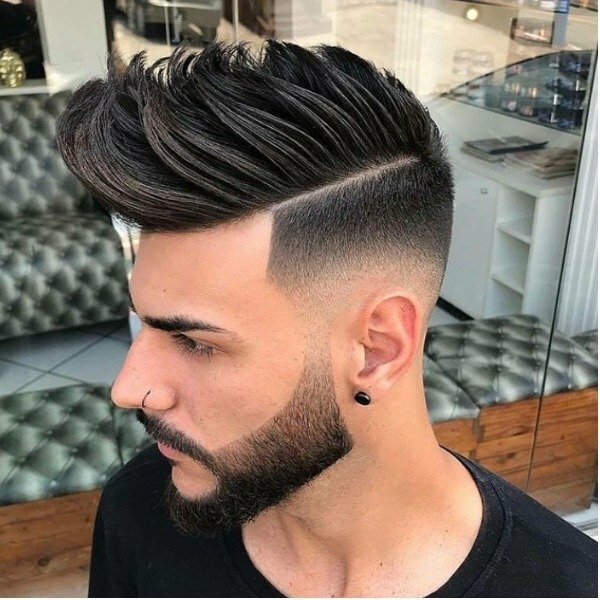 Featuring a fade that begins around the temples, this cut leaves plenty of hair up top to be styled, making it the natural pairing for a mohawk. 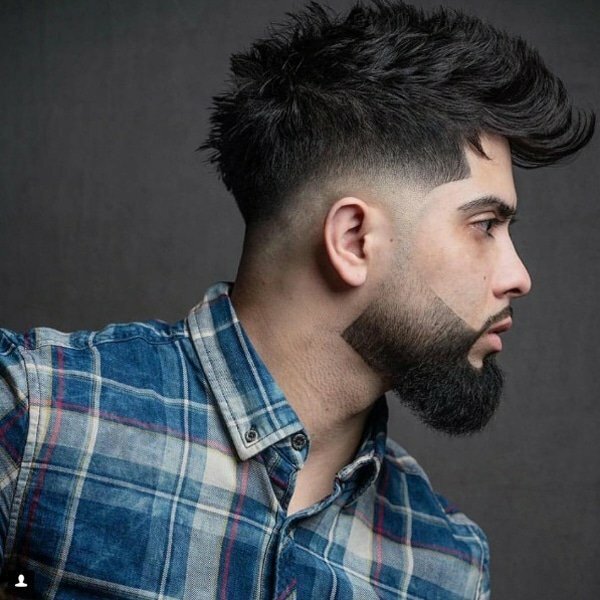 The subtle yet edgy approach to the fade also allows for versatility in your everyday grooming. So, if you love rocking a mohawk on the weekends but require a more traditional look for the office, this look is for you. 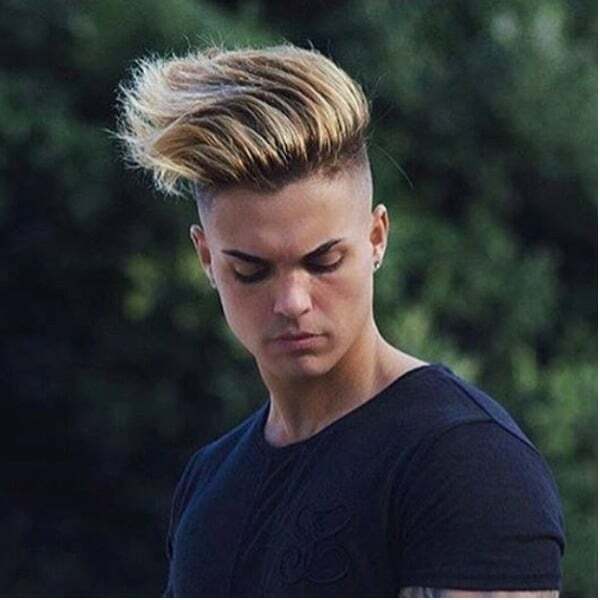 As a fresh and on-trend take on the traditional fade, a burst fade is an excellent option for mohawked men looking to show off their thick locks. Similar to a drop fade, this cut curves down around the ear towards the back of the head. What distinguishes the burst fade from the drop fade is that instead of continuing around the head, the hair at the neck is left longer. 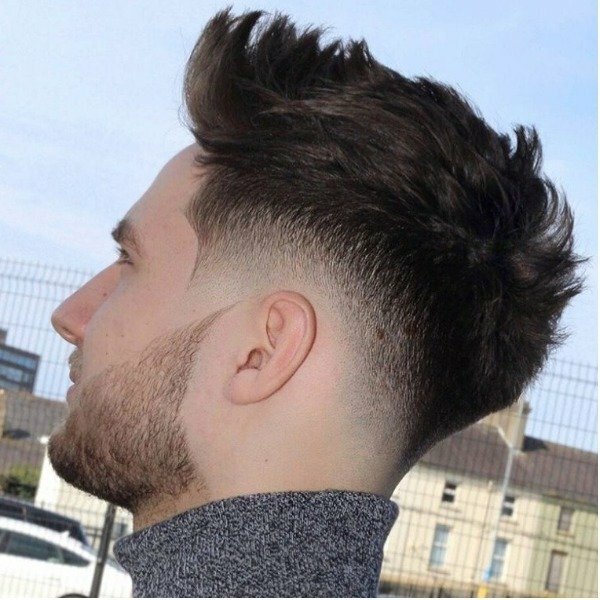 As a result, the combination of this fade with a mohawk allows you to create a statement style that extends from the forehead to the nape of the neck. For a more subtle approach to the daring mohawk, experiment with a sweeping side mohawk and fade. If you love the punk-rock mohawk aesthetic but don’t want too much height, this is the look for you. Instead of using your hair gel, spray or mousse to create a high-rise mohawk, just sweep your hair to one side. The only trick to nailing the look is to make sure you have created volume in your mohawk before brushing it to the side. Doing so will ensure your hair looks on trend and well-groomed rather than flat and unkempt. Add a little something extra to your new mohawk fade with a sharp, line cut. This involves shaving the hair at the temples into sleek, geometric lines. Then, consider enhancing your style with a hard part. By distinctly separating the top of your hair from the side, this line will emphasise the boldness of your mohawk. Regular grooming will be required to keep this look at its best. Therefore, either brush up on your buzzing skills or become best friends with your local barber. 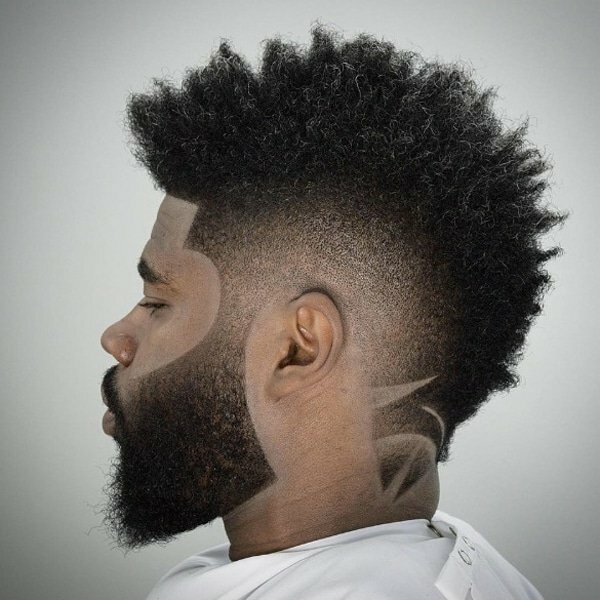 In recent times, countless black men across the globe have been spotted rocking a daring mohawk fade. If you fall into this category and have naturally thick, dark hair, it’s time for you to try this look. The thickness of your locks means that less styling product is needed to keep your hair standing tall, making it a perfect match for a mohawk. 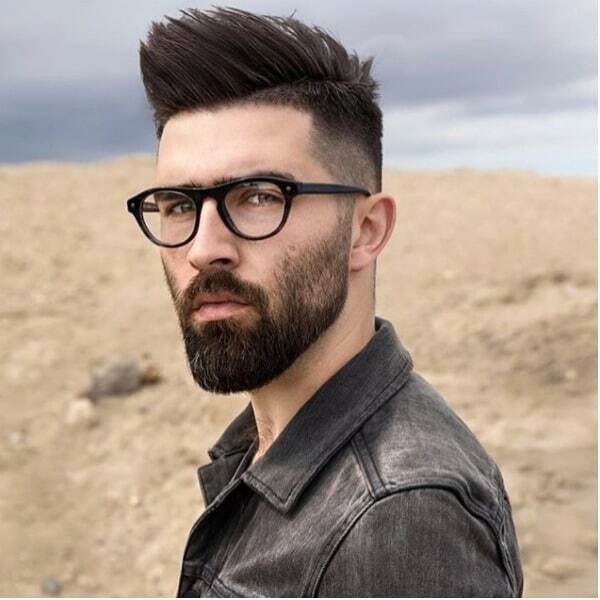 For a stylish approach to this look, we recommend incorporating a high fade and possibly even a beard. The best way to complement a strong mohawk up top is to match it to a fierce, masculine beard. Ensure that both your mohawk and beard are kept clean and well-groomed to make the most of this double-trouble look. Finally, for added emphasis and polish, shape up your beard into your fade. While this look will suit all hair colours, it is particularly striking with darker hair where the detail is sharp. If you’re fortunate enough to have natural, curly locks, put the hair gel down when it comes to styling your mohawk. Instead, let your curls run wild for a unique take on the traditional, punk style. 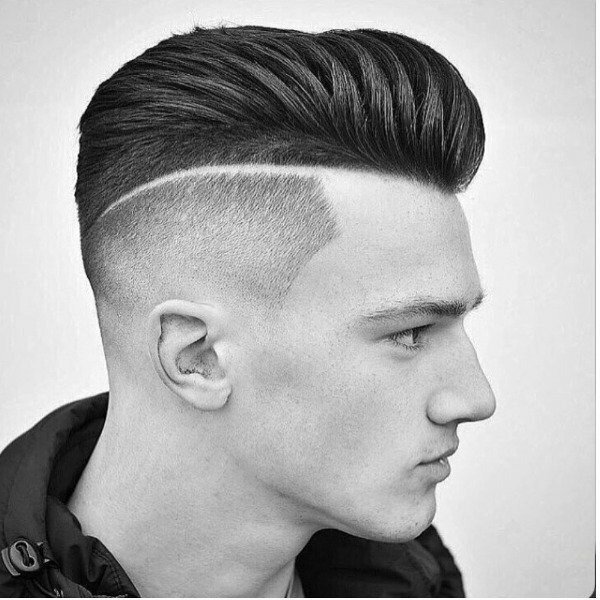 The incorporation of a high fade will be your saviour in maintaining this look by keeping all curls up top where they belong. As a result, this is also a great hair option for men who want to stay cool in the summer months while maintaining their hair’s length. Whether you’re looking for a Viking hairstyle or to simply set free your inner punk, a skin fade mohawk will have heads turning your way. 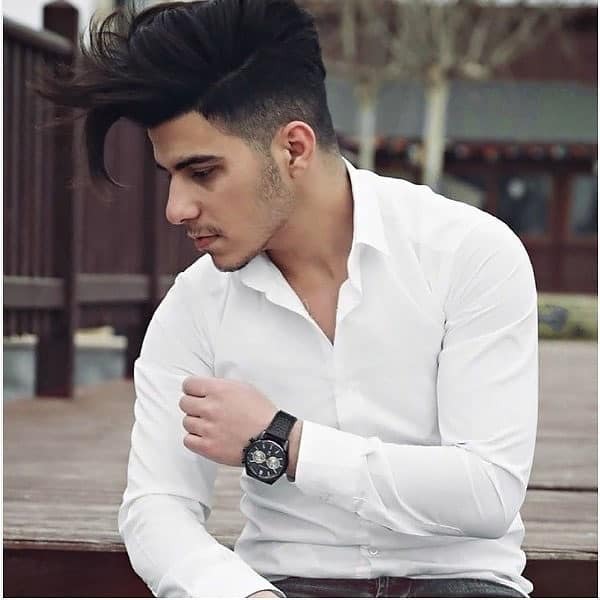 To create this look, you’ll need to fade the hair on the sides of the head down to the skin. But note that the higher you take your skin fade, the bolder the look will be. 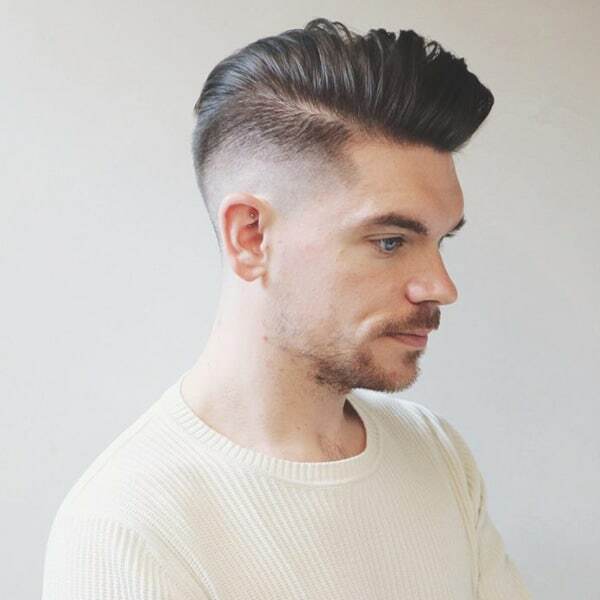 So, drop your fade low for a more subtle style or wear it high for a striking appearance. While creating a thick-haired mohawk can require a little patience, this effort is reflected in the results. As the mohawk’s key features are thickness and height, having thick hair instantly sets you on the path to success. 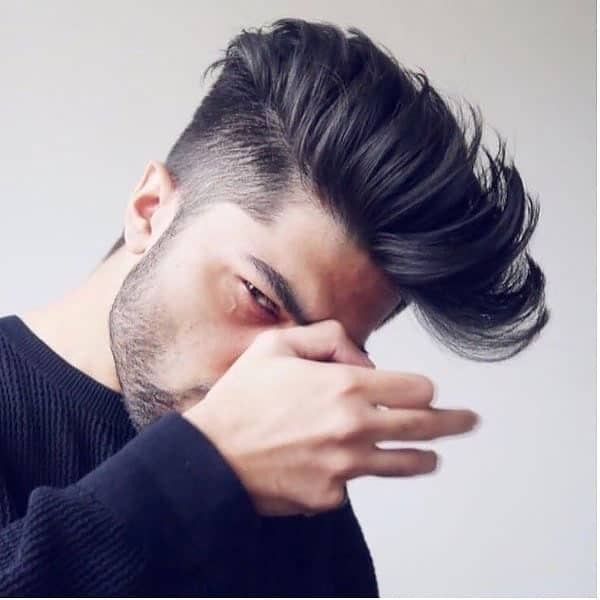 To balance out the thick hair on top, we recommend opting for a low or mid-fade. Finally, stock up on styling products because you’ll need that hair gel to keep your mohawk soaring high. Unleash your rebellious nature with a straight hair mohawk fade. Fortunately for you, those straight locks of yours will make your hair easy to style and manipulate. As a result, all that’s required to create this look is your favourite styling products, a comb and your clippers. First, use your clippers to create a fade. See our guides on the best drop, skin, low, and high fades if you’re unsure which is the best for you. Next, use your fingers to apply styling gel or mousse. Finally, with your comb, brush your hair upwards and towards the centre of your head to create an eye-catching mohawk. If you’re already rocking an afro, then you’re halfway to nailing the mohawk trend. For men with afros, your naturally thick hair requires little styling product to keep it looking full. As a result, it’ll be easy for you to achieve the volume and height needed for a mohawk. Therefore, when you’re ready to make the transition from ‘fro to mo(hawk), just grab your clippers or head to your favourite barber. 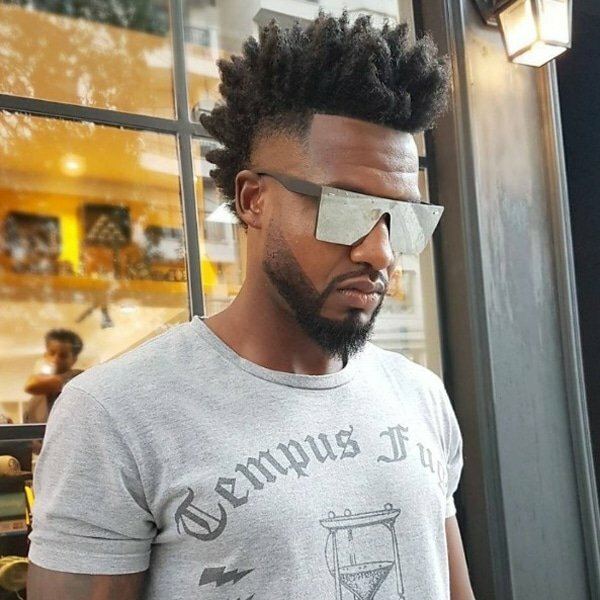 To complement the thickness of your afro, we recommend trying out a taper fade. Brush that blonde hair up towards the sun where it belongs with a well-groomed blonde mohawk. The incorporation of a stylish fade, adds character and depth to this surfer-meet-rebel look. 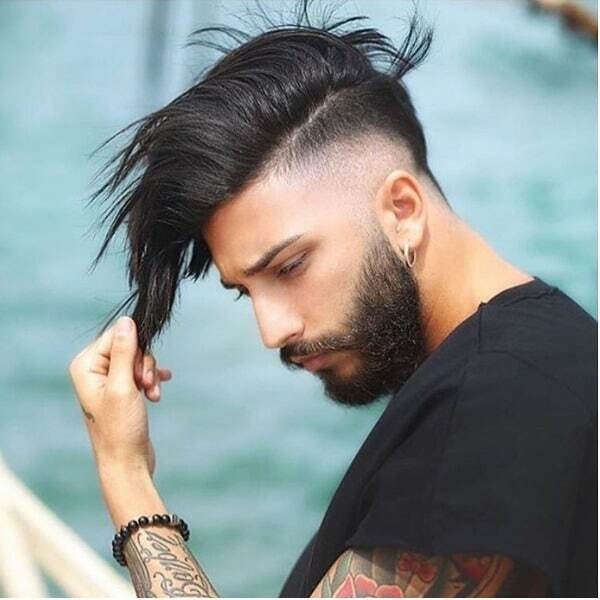 Additionally, by staying away from the traditional mohawk and its clean-shaven sides, this style provides a modern, 21st-century take on the trend.